Need a little help getting your tomatoes preserved this season? 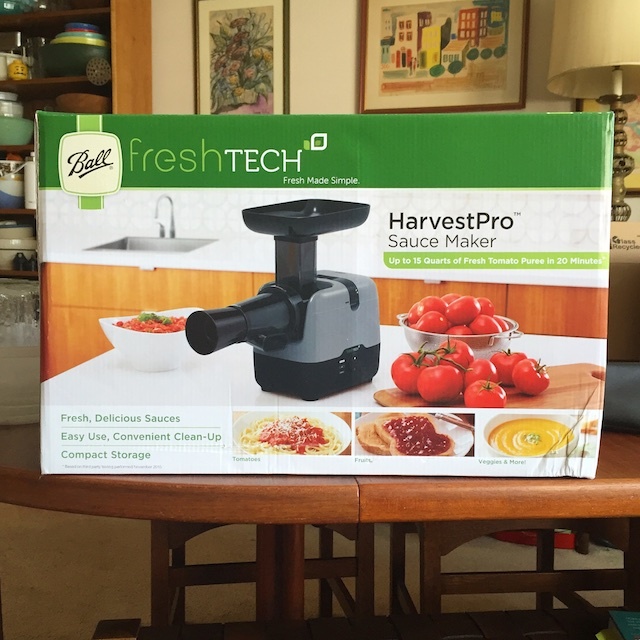 Check out the freshTECH HarvestPro Sauce Maker from Ball Canning! We are in the midst of tomato season here in the Philly area and I’ve been in something of a canning frenzy trying to get as many put up as I can before I hit the road again. I find that there is a huge flavor difference between home canned tomatoes and grocery store ones, and so I know that I’m going to be said come January if I don’t take action now. I used to do most of my tomatoes whole and peeled, packed in water. However, these days I find that I like to do a fifty-fifty split of whole tomatoes and tomato puree. I started doing a lot more tomato puree a few years ago, in large part because an electric tomato press came into my life. There are a few different brands of these handy machines on the market, and this year, our friends at Ball Canning added one called the HarvestPro to their freshTECH line of appliances. 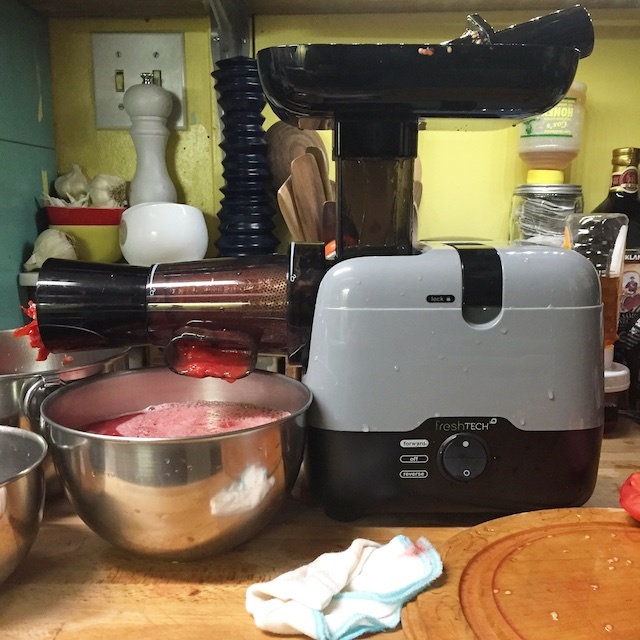 Having used a number of different tools for pressing tomatoes into sauce, this HarvestPro Sauce Maker is by far the easiest to set up, run, and clean up when you’re all done. It doesn’t splatter like my previous electric press, and the motor base plants itself solidly on your countertop. I’m a huge fan and will be making permanent space for this in my kitchen (or, more realistically, in my coat closet). Right now, all the freshTECH appliances are 15% off on the Fresh Preserving website (I’m also a really big fan of the Electric Water Bath Canner). If you want to see it in action, I’ll be streaming on Facebook Live tomorrow night (Tuesday, August 23) at 9 pm eastern time for about a half hour to show you how it works. I also have one of these handy machines to give away this week. Use the widget below for your chance to enter! Disclosure: Ball Canning sent me the HarvestPro you see pictured here for review purposes and they are providing the giveaway unit. What’s more, I am also a paid brand partner. However, this post is outside our paid agreement. I just really liked this particular machine and so asked if I could share it with my readers. All thoughts and opinions expressed are my own. I have froze them a couple times, would really love to be able to use this! Hoping to get a canner soon too. This would be a great product to try! I would love to can sauce this year. I love making salsa, canning tomatoes whole in water, making tomato sauce, or soup. This would make things so much easier for tomato purée AND apple sauce! This would have been very handy this weekend when I was hand milling 50 lbs of tomatoes into sauce! I have never tried one of these fancy machines. I would love to own one. I’ve never had anything to preserve … actually making my own sauce would change that, tho!! That’s a cool little machine!! Just spent yesterday & part of today making a huge batch of Bulgarian Lutenitsa, a tomato-red-pepper spread. Would have loved to have the machine you mention to smoosh the tomatoes. I ended up using my food processor to puree as finely as it could, then putting it through my food mill to get it smoother & lose all the seeds & skins that were left. Turned out incredibly delicious, ‘though, and that’s what’s most important! I can tomatoes as stewed tomatoes, tomato sauce or tomato vegetable juice. I love tomato season! I do them crushed in their own juice, and use at least one jar a week all year round. I also make salsa and pizza sauce. Love this time of year! That sounds delicious! I might have to add that to my tomato repertoire just so I can eat it with grilled cheese. I’ve done salsa and for the first time pizza sauce this year. I’ve never made sauce before so it was an experiment. We have so many tomatoes in the garden just now getting ripe! I usually turn them into salsa (“Mailman Salsa,” a recipe we got from our mail carrier, Mark), but this year I think I am going to put up some sauce, too! My friend and I have made marinara sauce for the past 2 years. It’s pretty easy, and everyone likes it! I usually roast and freeze w because I’m lazy, but this would make laziness more productive 😉 thanks! Salsa, plain sauce, spaghetti sauce, we love it all, and this would make it so much easier! I freeze tomatoes since it’s easy. Aving this would lead me to can more. I like to dice them up and can them. Very versatile. Second is to make a multipurpose sauce. Soon there will be new jars of tomato jam and salsa filling the pantry, along with the 100+ canned tomatoes. I simply cannot stand the tinny taste of store bought. I like to can whole tomatoes, salsa, rotels, tomato soup, gumbo soup(without the meat), pasta sauce and anything else I can think of. So far this year all I have done is whole tomatoes. Up next is the fun stuff. I tend to freeze tomatoes since I’ve been afraid of trying to can them. I freeze them, but I also have made tomato jam. Love canning them just for soups and sauces! I usually roast and freeze tomatoes, and make a basic freezer salsa from tomatoes, garlic and jalapenos roasted together. I’d like to try making more sauce — and this year I might get enough paste tomatoes from my garden to put up some sauce! I don’t really do enough to warrant a high tech motorized mill. I have a little hand crank one I really like. But I’ll enter anyway. Maybe if I had one, I’d can more tomatoes. I’ve always made sauce and canned them. This year though, I’m preferring to oven roast them with a little olive oil, basil and garlic, then peel, puree and freeze. It seems to make a less acidic sauce that way and that is what my stomach needs at the moment. I love to pickle my green tomatoes in beer. So good with sandwiches. Can as sauce. Freeze whole. I like to puree them, cook them down some and then freeze them. i can’t choose. I do salsa, tomato sauce, passata and chopped canned tomatoes. I also do spicy ketchup. I love tomatoes so man ways. Frozen whole, canned in chunks, as sauce, as salsa, bbq sauce, whole, and want to start canning as juice. This looks like an amazing tool and I haven’t seen it before! Very exciting. Lately I have been doing just regular diced tomatoes but I would love to try making sauce or puree! I have the fresh tech electric canner and love it! I bring it outside when it’s too hot to process in my kitchen! What a great time saver this would be. We make Pasta and Pizza sauce as well as garlic tomato sauce and crushed tomatoes to use all year. I love making tomato marmalade so I can enjoy all year long. Sweet and tart! I do love to sauce tomatoes! By favorite is the dehydrate and powder. Makes for a great sauce thickener and you can use all the skins and seeds! No waste! I have been freezing whole tomatoes to use year round. One year when I had a glut of tomatoes I made tomato paste and it was the best thing I ever made. If I had this machine tomato paste would be on my list every year because it would be much less work. I can equal amounts of salsa and tomato sauce. I just bought the Freshtec Electric Water Bath Canner this year, absolutely love it. I can process more jars than before, since I have a flat top stove. I’ve been using my Kitchenaid strainer attachment to make sauce, but this looks like a winner, with two screen sizes, larger auger and cleaning brush. Hope I win! Last night I used my dehydrator to dry some tomatoes. The idea is to use them in recipes, but I can’t resist chewing on them like candy! I have a hand crank juicer, but would love this machine. I usually can 40+ pasta sauce, salsa & tomato juice. This machine would make the process so much faster! So far I’ve only canned tomatoes whole. We did a mixture of salsa and the Animal, Vegetable, Miracle tomato sauce. The sauce maker would make our tomato processing so much easier! I probably make about 50% of my tomatoes into chopped form to be added to soups and stews later on, and just add some salt and lemon juice and use a waterbath for canning. The other half of the crop goes into salsa. I have a bleak tomato harvest this year, but This does not hold me back! A chili sauce cook out is planned for this weekend and oh boy could I put this baby to work! And it’s my birthday today. Maybe I am the lucky winner? This is my first year of canning. I can’t wait to take advantage of all the great Jersey fresh tomatoes. Thanks for all the great recipes and ideas. I have a manual press right now. I wouldn’t mind to have a faster way. This sounds like a wonderful product! I have canned them and froze them. I love them canned or eaten fresh. Great ideas. I usually do whole tomatoes in water, but this would make it so much easier to do pureed!! Salsa and Sauce are my favorite way to preserve tomatoes. Have not found this in stores! Will be looking now! I do diced, a regular salsa, your roasted corn salsa, and tomato chutney with the ripe ones and make a green salsa with the green ones or pickle them. I go through buckets and buckets of tomatoes and love it! I have always frozen my marinara and whole tomatoes before. This is the first year I’m going to try canning them. The local tomatoes are several weeks behind due to the weather so it will be another 2 weeks before they are ready. I have my order in already with my favorite local farm for 2 cases! I make pizza sauce out of *orange* tomatoes. It looks like butternut squash but tastes incredible and makes the best homemade pizzas. I could make a LOT more sauce with this tool! We are a tomato loving family and like to can whole and diced tomatoes to make soups, sauces, casseroles and salsa. This would be an amazing tool to have! We usually do tomato sauce, mildly seasoned so it can be used for anything. I can salsa and chopped tomatoes. I don’t like whole tomatoes in my dishes so I never can those. I love canning whole tomatoes to use any way I like later. I usually pack most of mine whole in their own juices because they’re so versatile. Also put up a few dozen jars of salsa. I love canning stewed tomatoes. I’ve always used the hand-cranking Foley Food Mill, this neat appliance would make the juice/ sauce making so much more efficient. I’ve not used the mill quite as much in the past 3 years as time is much more limited with my work schedule, so I’ve been doing mostly stewed tomatoes. A beautiful jar of rich tomato juice would taste so great right now! Wow that is 10 kinds of awesome! I’m just getting into canning tomatoes and I did fresh tomatoes that I cooked in the slow cooker for a while before I put it into jars. Ha! Had to laugh about storing this in the coat closet! When I looked at it and thought – Wow! That would be great to have! – I also immediately thought… Where would I store that? But I have a load of tomatoes sitting on my counter top and will probably make salsa, as I haven’t won anything yet. What else, besides tomatoes, is it useful for? I just recently made Tomato Jam for the first time. So good! Definitely will be a staple in my pantry. My favorite way to preserve tomatoes is in salsa or spaghetti sauce. My favorite way to preserve tomatoes is to can them diced in water. Perfect for chili and soups! This looks like a life saver (for applesauce too). canned stewed tomatoes get used up super fast in my home. I love to make salsa! I am a beginner. I’ve made blueberry and peach preserves, pickles and this year relish. I’m hoping to can some tomatoes this year. This machine looks like it would make it a whole lot easier. Pick me! Stewed tomatoes in pint jars! Oh, this looks like an awesome appliance to add to my arsenal! It would sure make canning tomatoes a breeze. This year, I added pizza sauce to my canning repertoire…woo hoo! I usually preserve them diced in their own juice or oven roasted in olive oil, roasted garlic, and onions. I would love to start doing tomato sauce though! This would be so handy. I’ve been wanting to make sauce. I usually can diced tomatoes, but would like to branch out and make soup and sauces also. We roast about 400 lbs from our farm every year. And then run them through a food mill – this would be so much easier! I would love to try this appliance. Have put up 80 lbs. of tomatoes so far this season…blanched and quartered with bottled water and lemon juice. I love making paste. I pop it in the oven to bake the moisture out and then can it in small jars. I love adding the paste to my soups to give them extra roasted tomato depth! I love preserving tomatoes in your tomato jam recipe. Yum. I love whole in their own juices. Once a year process that gets me through the following August! This would be so much fun to use! It would definitely expand my tomato canning experiences! I love to can salsa, whole & quartered tomatoes, and tomato sauce. My husband’s ONE requirement from my veggie garden every year is tomato, any style. I’m usually up to my ears with them! This would be soooo wonderful to help me preserve sauce every year! spicy salsa or marinara sauce! For me, it’s tomato jam! I like to make tomato sauce and juice. I use the juice to make tomato soup in the winter. This summer I am cooking up squash and tomatoes and freezing the mixture. It makes a nice taste of summer added to pasta in the winter. My favorite way to preserve tomatoes is plain ol crushed tomatoes. So versatile and useful! I love my marinara and my sun dried, but crushed tomatoes are essential to my daily cooking! I love make my Ranchero sauce with tomatoes. favorite way to preserve tomatoes, this season, is a simple sauce – marinara, or maybe a basil-garlic out of Ball. and i always put up tomato paste. Although I can no longer eat tomatoes due to dietary restrictions, a former neighbor of mine taught me that you can freeze tomatoes whole and then pull them out individually as needed and run them under tap water to remove the skins before adding to a cooked dish. I usually preserve tomatoes whole, but have been wanting to make a sauce. This would be awesome. I’ve been harvesting bags full of tomatoes these last few weeks and would love to try canning a sauce instead of my normal whole tomato method – thanks for the great giveaway! I haven’t done tomatoes in a while but lately, I’ve been making Chicago deep dish pizzas which require crushed tomatoes. That machine would make it a snap!! I mostly peel and quarter them. I also do puree using my hand crank Squeezo. This motorized one would be great. I make sauce and freeze. I make pizza, chili, pasta and salsa…and can them…love them all so I have no favorite! We put up 20 pints of plain tomato sauce this weekend (and broke our immersion blender in the process). Hopefully it’ll last us until next summer! I usually just can my tomatoes whole and peeled. Or I make pasta sauce and freeze it. I have never done it but plan to can some whole roma tomatoes this year for use in sauces year round. I love love the electric canner. Not just another appliance…keeps the stove clear and the kitchen cooler. My favorite way to preserve tomatoes is as sauce. But I’m getting other great ideas from the comments here! I really need one of these my tomatoes are just going crazy and I desperately need to make sauce! I usually blanch grind and strain the puree. They can the puree. It’s a long process to do by hand. I usually do 50-75 jars to last me the winter season. This would be a great addition. I love making tomato sauce. It’s so versatile. I usually blanch the tomatoes, then grind it through my food mill and then simmer it before I process it. I like to make salsa and pizza sauce, those things get used the most in my house. I last used my food mill to make the sauce, but this things looks even better! Though it might be a bit bulky to store. Canning! I’m trying smoked tomatoes and then canning them! This machine sounds amazing!! would it also work for berries to get out seeds for making jam/jelly? I roast them and then throw them in the freezer…works for me! I love to just can tomatoes any and every way. I can alot of tomatoes crushed because they are so versatile. My family however votes that salsa is their favorite way to can tomatoes. So far, I’ve only made tomato sauce, pasta sauce and pizza sauce, all in the freezer. I’m still anxious about pressure canning, but I would like more shelf stable sauces, plus whole tomatoes and tomato juice and salsa. I can whole tomatoes every year. The best way I know to keep tomatoes is to can them which I have done lots of. Thanks for the great giveaway. I use crushed/pureed tomatoes more so than whole. I normally use my food processor to make sauce, but I’d like to try this! I normally use a combination of a blender and a food processor, but this sounds great! I am just learning how to can and canning tomato sauce is what I want to learn next. Whole or quartered peeled tomatoes – I use them mostly for slow cooker soups. Now that I’m retired I think puree might be added and my daughter is going to show me how she makes the most fabulous dried tomatoes. I have a whole lot of tomatoes to process. This would sure come in handy. Good to hear that clean up is easy. That’s usually the worst part of just about any kitchen work. I like to make marinara… I need this! I have one that mostly just gets juice all over the kitchen! I have never preserved tomatoes before because the work scares me! I hope to make some of your tomato jam this month, or ketchup! My grandmas taco sauce is my favorite. Haven’t had the opportunity to preserve tomatoes in large amounts before, this year I am finally able to do some! I love drying and slow roasting tomatoes and making savory sauces. I like to can whole tomatoes as well as make sauces – I make a lot of tomato based soups in the cooler months so home canned tomatoes are essential!!! It’s so nice to open a jar of home made sauce with all the summer veggies already in it – why it’s almost soup all by itself. Every once in a while I even sit down with a pint jar & eat the whole thing for dinner instead of cooking, hahaha. There’s no taste like home grown, field tomatoes that have been allowed to ripen on the vine!!! I have never canned tomatoes they usually don’t last in my house my family loves to eat them like apples. This looks like the perfect thing to make my own sauces. I love to try new things and to have things that make it easier is great. Stewed and canned is my all time fave 🙂 Close second is salsa! I like to can tomatoes either as sauce or whole although this year I froze my tomatoes. My favorite way to use tomatoes is my a homemade chutney and tomato sauce. I just bottled off 7 jars of chutney and now I’m getting ready to bottle some whole ones. I haven’t tried canning tomatoes yet but this looks like a cool machine. I love the electric waterbath canner…so nice to have a clear stove top! I like to roast and freeze tomatoes for soups and spreads, but winning this sauce maker might just change my ways! I have only ever frozen tomatoes, but I’m considering trying to can some. This piece of equipment would be a great help at harvest time! How sweet is this! My tomato crop this year is near failure, but I know where to beg more than I need ; ) Next year – great crop. I really like having tomato puree on hand all winter and get tired of using my food press – this would solve that problem! Tomato jam is my favorite. Followed closely by salsa. Thanks for the giveaway! Any way I can can them-I LOVE tomatoes and I want them all year long! I would love to have this machine! I usually roast tomatoes and turn them into sauce for freezing, but would love to give canning a go with this handy machine! Hoping to put up 100 pounds. Would love to try this appliance. Our Yakima, WA , tomatoes are to savor. Roasted Roma’s with garlic are a family favorite and my sisters are bugging me to can more tomato basil jam. My favorite way to do my tomatoes now is with my electric roaster. I blanche them and give them a coarse chop them I pile them into the roaster and let them go for 3-4 hours. after they have cooked down I add onions, peppers, and my spices and let them cook for another hour or so with the lid off. Then into the hot jars and process in a hot water bath for 45 minutes. Nothing like that fresh tomato flavor all year round. HI, I love making the tomato powder with dehydrated tomatoes. If I can find a really good deal on tomatoes at the Farmers Market I am going to draft Jeremy into coming over and helping me make tomato soup and can that. Cousins day! Dried or sauced are my usual methods, but I’ll do anything I can think of to keep tomatoes into winter. I have always wanted something like this for making tomato sauce in summer. Right now I have my trusty dehydrator to preserve them. I love roasted tomatoes with garlic and onion; I purée this and freeze it for winter goodness! Got a new dehydrator, so want to try drying them too. I’m just learning…the only way I’ve preserved tomatoes in the past is stewed. Would love to make sauce! I like tomatoes all ways. Frozen and canned sauce is awesome for easy cooking. Two year ago I tried to make sauce and it did not go well. Right about the time it thickened up enough to start thinking about sterilizing the jars, my water bath canning pot sprung a leak. It took till 12:30 am on a work night doing batches in my stock pot. Here’s hoping this year goes better. This is just what I’ve been looking for. Thank you for showing us the new Ball Sauce maker. Whole canned and tomato confit. I have been oven roasting in olive oil for use out of the fridge in salads and breakfast scrambles, but am about to be underwater in tomatoes so would love a gadget like this! Does it count to “preserve” them in bolognese sauce that I freeze? We usually roast tomatoes but last weekend we made tomato jam. A friend is looking for a machine similar to this as he is borrowing a friend’s machine to make apple puree that he is then turning into fruit leather using a dehydrator. Nothing better then fresh spaghetti sauce. I get so bored with the whole prep work of the tomatoes but when you taste that sauce during the meal it makes it all worth it. I bet this handy machine would make life so much easier! I’ve only canned whole peeled tomatoes and your honey tomato jam recipe. I want to try more recipes. I haven’t done it yet! I was too scared. This season I have SO MANY. I want to make Italian sauce and can it. This is my first year with a garden so I’m still learning how to preserve my harvest! I always make a tomato sauce and tomato paste, usually about 60 qts/year. I love making a simple sauce by grating the tomatoes, sauteing garlic and cooking it all down. Fresh basil from CSA finishes it all off. So simple but so tasty! I’ve used a hand-crank model to process tomatoes for a number of years, but it now leaks badly. I also used it for apple sauce and pumpkin puree. My favorite way to can tomatoes is in dices, since that’s the way I usually use them. I hope I win! I have never canned tomatoes before but my 24 (!!!) tomato plants are getting veeerrryyyy heavy with green fruit so I’m preparing for a deluge in a week or two. I recently roasted them and then blended and canned tomatoes. thanks!! I freeze about half of our tomatoes as puree; the other half is frozen as spaghetti sauce (with basil and oregano). I have only canned tomatoes one and was surprised at how much work it was! I found a recipe in the “Ball Blue Book guide to preserving” for Basil – Garlic Tomato Sauce. It was a great sauce to use as a base for many Italian dishes I enjoy making. I would make the sauce again if I had an easier way of processing the tomatoes. This machine would really help. Tomato basil soup…spaghetti sauce would abound with this device! If only my tomatoes had ripened better this year. We had a bizarre crop. But I just bought a bunch at a farmer’s market to make sauce with. This sounds like it would be great for getting tons of tomatoes really fast. I always can sauce but I might try whole tomatoes this year. Tomato sauce right now…newbie here! I love to make sauce or salsa. That way I am preserving more than tomatoes at a time. I make lots of spaghetti sauce, crushed tomatoes and pizza sauce. Matt and I were just looking at some of these sauce making gadgets and wondering how they’d compare to our chinois/hand press. That is the only way we’ve done tomatoes (sauce, mostly) and we own all the required tools, but it sure seems like these contraptions would be slick, if they worked as well as promised. So, I am glad to hear your review of this one, as we’d been reading up on them already. I mostly freeze them because slipping the skins off is pretty easy. Loved your video last night. Every summer I roast my San Marzano tomatoes and make sauce for the winter. Oh so good! Diced tomatoes is my go to. I can tomatoes every year but always just chunk them up and do it that way. I’d love to do something different and think this would be a great start. Strangely enough, I make all kinds of salsa for other folks. But for myself, I am usually doing diced or sauce, maybe I’ll branch out into pureed or crushed this year! I normally love tomatoes fresh, but I love to preserve dried tomatoes in oil. I love roasting tomatoes and then freezing them. They become like tomato candy! My favorite way to preserve tomatoes is roasting them, then popping them in the freezer to enjoy all winter. But–this year I have plans to do some canning of whole tomatoes as well! I just finished two bushels of tomatoes and wished the whole time I had one of these!! I can and I freeze. I would love this! So much easier than a food mill. Roasted romas are my favorite to pull out in the middle of winter. YUM! I haven’t preserved them yet. I’ve been too scared of the process! I like to roast some and freeze or can them whole packed in water. I’ve never done much with sauce since I don’t own a food mill. This would sure make it easy to can tomato sauce! My favorite is tomato jam! Thanks for the giveaway! I am just learning how to make sauce. Thanks for the giveaway! After visiting Italy and tasting the freshness of their pizza sauces, I would love to start making my own! I make diced tomatoes and salsa. I’ve never had to preserve my tomatoes. I eat them as fast as I can grow them. Maybe the problem is I need more tomatoes. I have been freezing them but this will be my first year to can. Crushed tomatoes! Easy and tasty! I’ll preserve them by canning crushed tomatoes and maybe some juice, too. Crushed tomatoes are my standby! I also do salsa when I have a bumper crop of jalapenos and habaneros. I’m a fan of simple diced tomatoes (though recently we’ve been tearing through our batches of arrabiata sauce). Canned tomato sauce is a favorite, with tomato juice being a close second. Diced tomatoes with jalapeño peppers are my favorite! We can a lot of tomatoes, but my favorites are pasta sauce and tomato soup. I love to make homemade sauce and this will make my life easy! I love to make your tomato jam recipe! Hands down my favorite way to preserve some tomatoes every year. I like to preserve tomatoes in jars to use later for pizza and pasta sauce. I also like to dehydrate and freeze them, they are excellent on sandwiches and pizza! Crushed plain tomatoes in jars is my favorite way to preserve them… so easy to open them up for soups, stews, or whatever kind of sauce we want. Crushed or whole waterbath canning. Would like to try this. Does it work with other fruits and vegetables? I usually like to freeze them. I like to skin and freeze then to make pasta and pizza sauce later. I love dicing my tomatoes for preserving! Sauced! In fact, I’m canning right now..